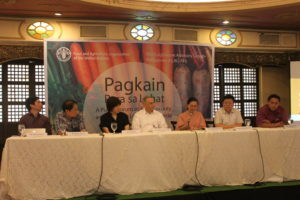 The FAO Legislative Advisory Group-Philippines (FLAG-PH) hosts the first public forum on food security and nutrition with legislators, in partnership with the Food and Agriculture Organization of the United Nations (FAO-UN), Asian NGO Coalition for Agrarian Reform and Rural Development (ANGOC) and Catholic Media Network (CMN), at Ilustrado Restaurant in Intramuros, Manila, March 26. 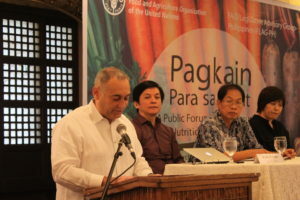 The forum is launched to raise the awareness of the public on existing and proposed legislation relevant to improving food security and nutrition in the country. Honorable Bernadette Herrera-Dy, FLAG-PH Interim Chairperson, presented RA 11148 or the “Kalusugan at Nutrisyon ng Mag-Nanay Act” which she authored. RA 11148, also known as First 1,000 Days of Life Law is enacted on November 29, 2018 that seeks to strengthen and define the roles of DOH, the National Nutrition Council, and other government agencies to implement nutrition programs in the first 1,000 days of a child’s life. “Following the success of RA 11148, I hope we will be able to create more policies that will empower our women, improve health and well-being, and solve malnutrition and hunger,” she added. 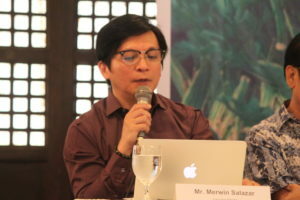 Senate Economic Planning Office (SEPO) Executive Director Erwin Salazar and Congressional Policy and Budget Research Department (CPBRD) Executive Director Manuel Aquino both discussed the state of food security and nutrition legislation in the country. Bills that are enacted include Rice Tariffication Bill, Free Irrigation Service Fees, and the before-mentioned RA 11148. Most are still pending in the Senate, particularly the National Land Use Act, Strengthening the Philippine Agricultural Insurance Program, the National Extension System to Accelerate Agriculture and Fisheries Development, and the Right to Adequate Food Framework Act. 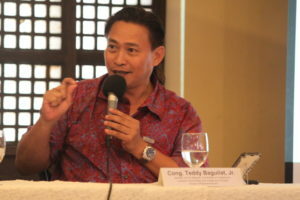 Meanwhile, Honorable Teddy Baguilat Jr., representative of the Lone District of Ifugao and member for the Majority House Committees on Agrarian Reform, talked about his co-authored bill National Land Use Act (NaLUA). 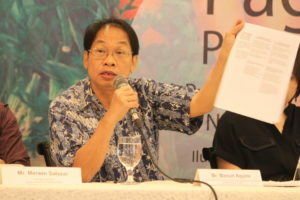 Baguilat emphasized the “need” to determine clearly which areas are “able to feed 145 million in the next 50 years” while also identifying where housing and infrastructure are more suitable without further destroying watersheds. 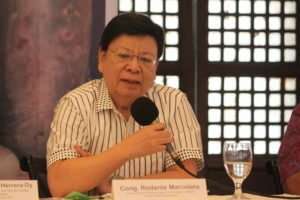 Honorable Rodante Marcoleta, Senior Deputy Majority Leader of House Committee on Rules, addressed that the challenge is food security versus food sufficiency. He shared that the Philippines is on the latter part of the list of countries around the world that are able to secure people from hunger. According to him, there were 17 proposed House bills as of March 11, 2019 yet out of those, 15 are still pending. 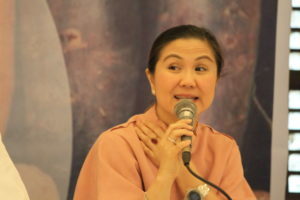 “Why not pass a bill that will institutionalize assistance to the poor,” Marcoleta stressed. 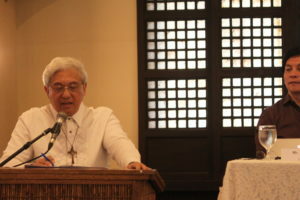 He also added that today, the representatives are advocating that “universities and community colleges should take part in” and help the barangays to be able to address the problem of malnutrition. FAO is a specialized agency of the United Nations that leads international efforts to defeat hunger. To further strengthen its partnership with the Philippine government, FAO initiated the creation of FAO Legislative Advisory Group-Philippines (FLAG-PH) in 2018. It aims to provide a forum and an advocacy platform for members of the Congress and FAO to exchange views and consult each other on legislative actions on food security, nutrition and sustainable agriculture.